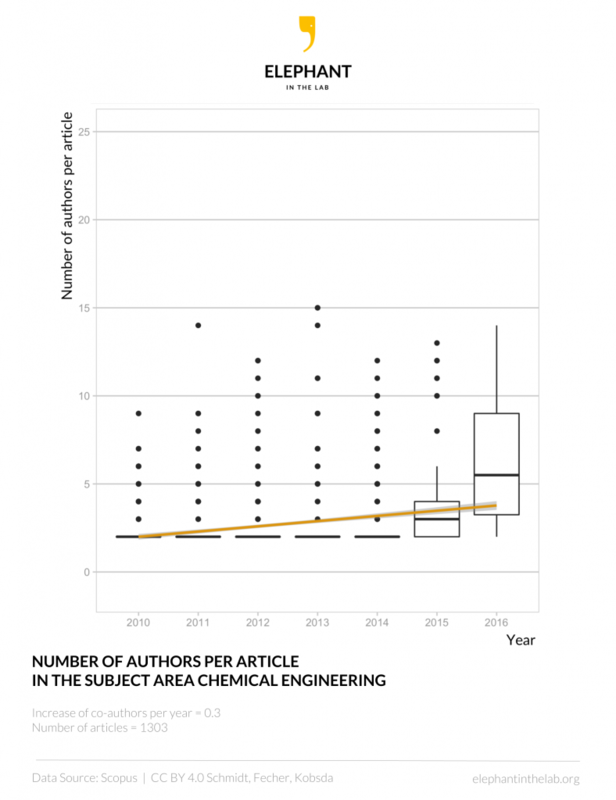 The number of authors per article in the subject area Chemical Engineering is 2.6 on average with a maximum of 15 authors. The mean number of coauthors is increasing by 0.3 per year in the respective time period (Figure 1). The articles in this analysis (n = 1303) were cited 5.9 times on average with a maximum of 112 citations. 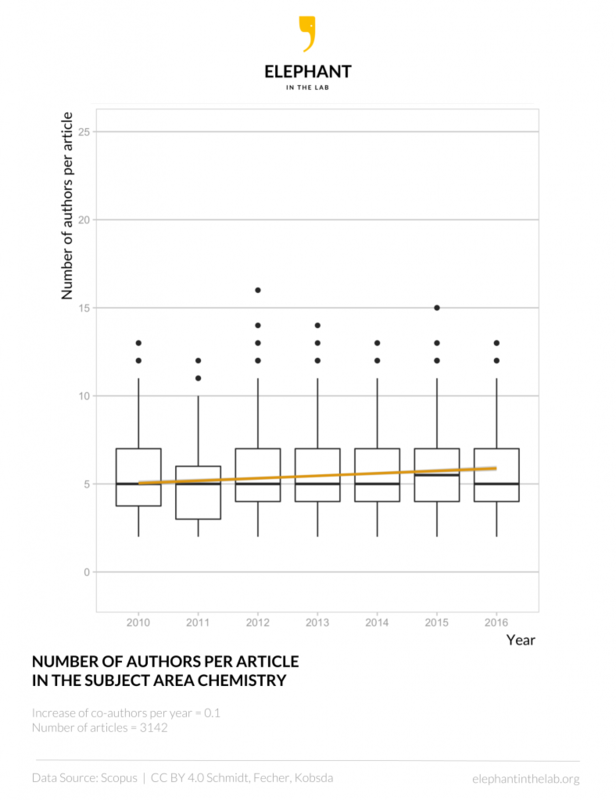 The number of authors per article in the subject area Chemistry is 5.5 on average with a maximum of 16 authors (Figure 2). The mean number of coauthors is increasing by 0.1 per year in the respective time period. The articles in this analysis (n = 3142) were cited 13 times on average and 562 as maximum. Figure 1: Boxplot of the number of authors per paper in the subject area Chemical Engineering. The box denotes 25–75% of the values with the median (bold line) in it. The small circles are outliers. Due to a limitation of the y-axis, some outliers might not be visible. The yellow line shows a linear model of the mean number of authors per article with a confidence interval of 0.95 shown in light grey. Data source: Scopus. 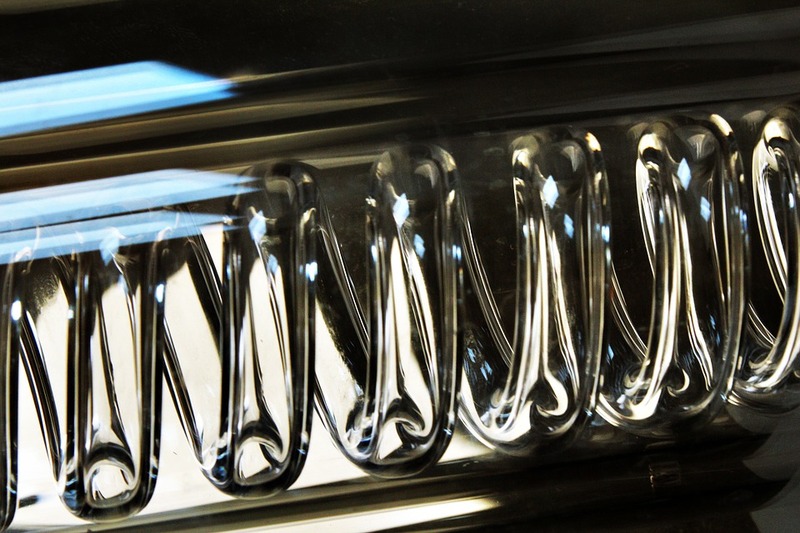 CC BY 4.0 Schmidt, Fecher, Kobsda. Figure 2: Boxplot of the number of authors per paper in the subject area Chemistry. The box denotes 25–75% of the values with the median (bold line) in it. The small circles are outliers. Due to a limitation of the y-axis, some outliers might not be visible. The yellow line shows a linear model of the mean number of authors per article with a confidence interval of 0.95 shown in light grey. Data source: Scopus. CC BY 4.0 Schmidt, Fecher, Kobsda. 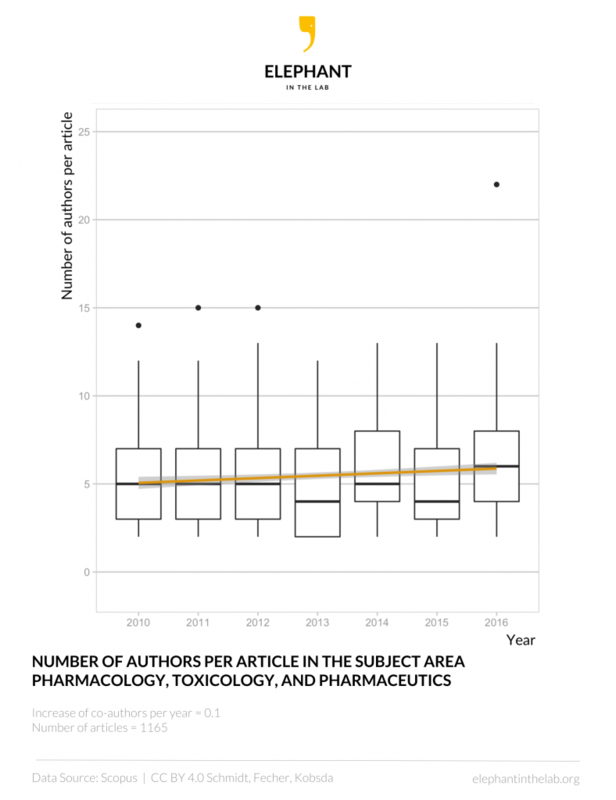 The number of authors per article in the subject area Pharmacology, Toxicology, and Pharmaceutics is 5.5 on average with a maximum of 47 authors. The mean number of coauthors is increasing by 0.01 per year in the respective time period (Figure 3). The articles in this analysis (n = 1165) were cited 16.8 times on average with a maximum of 526 citations. Figure 3: Boxplot of the number of authors per paper in the subject area Pharmacology, Toxicology, and Pharmaceutics. The box denotes 25–75% of the values with the median (bold line) in it. The small circles are outliers. Due to a limitation of the y-axis, some outliers might not be visible. The yellow line shows a linear model of the mean number of authors per article with a confidence interval of 0.95 shown in light grey. Data source: Scopus. CC BY 4.0 Schmidt, Fecher, Kobsda. and a quantitative limitation regarding the publication output (articles by the 20 highest performing authors with the most Scopus listed articles in every subject area). For details and code see Schmidt et al. 2017. This blogpost has a DOI and is uneditable. Martin Schmidt is a doctoral researcher at the Institute of Landscape Systems Analysis within Leibniz Centre for Agricultural Landscape Research and associate researcher at Alexander von Humboldt Institute for Internet and Society. Benedikt Fecher is the programme director of the research programme Knowledge Dimension and heads the Open Science research group at the Alexander von Humboldt Institute for Internet and Society. Christian Kobsda works as the political consultant at the Leibniz Association and is an associate researcher at the Alexander von Humboldt Institute for Internet and Society.